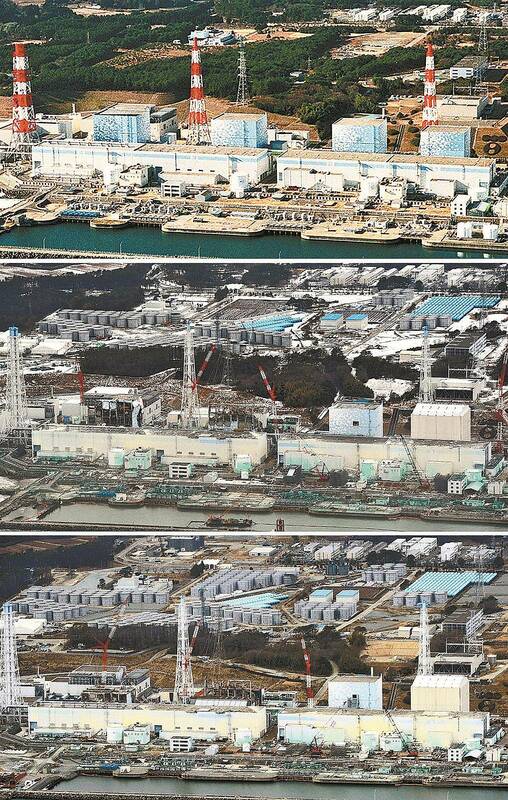 These three photographs of the Fukushima Daiichi nuclear power plant show the spread of the tank farm required to contain the contaminated water accumulating at the crippled nuclear power complex. After getting the approval of fishery cooperatives in Fukushima Prefecture last Friday, Tokyo Electric and the Japanese government have announced that they will begin pumping groundwater at the Fukushima Daiichi nuclear power plant on Wednesday. The fishery cooperatives gave their approval of the groundwater release plan as long as the groundwater released into the Pacific Ocean meets environmental safety standards and a third party is involved in the inspection and discharge operations. While the government and the utility agreed that a third party will join in the process, no nominations have been made for who that third party will be. The fishermen also demanded that the government assume responsibility for any damage from rumors about the fishing industry. Workers at Fukushima Daiichi hope to pump groundwater flowing from the mountains near the plant before it mixes with highly contaminated water in the basements of the crippled reactor buildings, but do not know the levels of contamination that the water will have. The utility says it will immediately start preparations, begin pumping water by Wednesday, but it will take around thirty days to analyze the groundwater prior to release. According to the government and the utility, the pumping plan is essential to partially dealing with the volume of contaminated water accumulating for storage on-site.